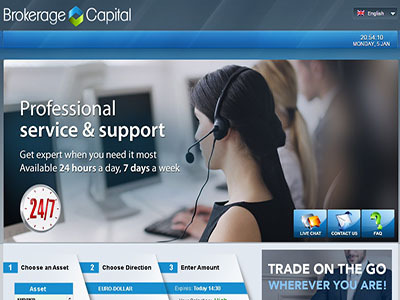 BrokerageCapital.com is a new broker with a fresh look and several attractive features. The most notable being 48 hour withdrawals but more on that a little later. This broker is operated by PM Investment Capital LTD and is based in Nicosia, Cyprus. There is no mention of regulation on the website but if it is truly Cyprus based then it will have to comply. At first glance you may think the platform is totally new but it is in fact a white label used by brokers such as OptiMarkets. The platform is actually OK and provides a wide range of trading but there are better brokers for you to choose. This one may simply be out to get your money. The first thing that caught my eye when checking out this website was the claim of 48 hour withdrawals. I don’t know about you but this is perhaps the most important feature of any broker. It is important for your broker to have the type of options you want, the assets you like and the expirations you need. This can vary from broker to broker and trader to trader. The need for good withdrawals, withdrawals free of any hijinx or shenanigans, is paramount. 48 hour withdrawals of profits is the fastest I have seen advertised and a big deal for traders. Too bad it’s not true. For one thing, the terms and conditions, the agreement you make with the broker once you open and fund your account regardless of whether you have read it or not, clearly states that withdrawals will take up to 14 days. This time is dictated by the financial department and will be the longer of the time set by them or 14 days. Thats a whole lot longer than 48 hours. FYI-The big 325 pixel banner on the home page that says to click here to learn more about 48 withdrawal is dead, there is not link. The platform offered by this broker is OK, not the best but OK, and they have the most extensive asset list I have ever seen. The platform supports binary digital options of the high/low variety as well as touch, one touch, range and turbo. Turbo is their name for short term binary options with expiry of 5 minutes or less. The asset list includes all the commodities, not just gold, silver and oil like most but all the commodities. Sugar, wheat, copper, cotton, platinum and others. There are over 2 dozen currency pairs, 3 dozen international stock indices and over 150 stocks. The thing is, every time I went on line to check up on the broker they never had that many available. At most I was able to find 3 or 4 commodities, about 10 forex pairs and a handful of indices. I found expiry to be a little limiting as well. Aside from the turbo options expiry for the standard digital options was limited to a couple of intra day for the current day, an end of the week and an end of the month expiry. I always do a thorough reading of the Terms And Conditions of every broker I review. This is mostly to make sure what deposit, withdrawal and bonus conditions are. This time I found something I have not seen before and I am not sure how to take it. BrokerageCapital.com does not allow you to cancel trades, at all. Most other brokers allow you a few seconds to cancel trades in case you made a mistake. If you abuse the tool you can get shut out of the brokerage but it is there. This broker says there is no cancellation of trades, period. The bonus is another area of concern. I don’t think highly of bonuses to begin with but if the rules are clearly laid out and you know what your getting into then OK. This broker has a bonus system set up like most others, the more you deposit the more bonus you can get. It is unclear if you have to request it or not because they say they may give you a bonus automatically from time to time. The minimum trading volume is only 10 times the deposit, super low, but may also come with other deposit, volume and/or time limits. I hate to let one bad broker tarnish the reputation of another, especially in this case when there is no evidence at this time that Optimarkets and BrokerageCapital.com are run by the same people. However, my first reaction upon finding the tenous connection between them (white label platform) was not diminished upon learning more. There are just too many similarities between the two, including a lack of substantial verbage in the terms concerning withdrawals and my money. I just don’t get a good feeling from this one, I think you can do better. Further, at this time I suspect this broker is not actually in Cyprus as I can find no record of them on the CySEC website. I found several other registered brokers but not this one. Additionally, the minimum trade of $200 is just too high for most traders to even consider this broker. They may tell you they are grooming only the big hitters, the whales and the pro traders. . . I say they are setting people up for a fleecing.